It’s a scary world out there and whilst technology brings opportunities, that also means that there are new security challenges facing us. The dangers are everywhere: stolen identities, systems held to ransom, phishing scams – the list is almost endless. It therefore definitely pays to be aware and know what you’re facing, that way you can be prepared and on the front foot. Join four of our top security experts to hear their point of view and their vision for security across the globe. Our vice presidents from Asia, Middle East, Australia and Africa, America, Europe and the UK will share their frontline experience of dealing with some of the security challenges in their region. Cybersecurity is a truly global concern with attacks and threats emanating from all over the world. The way each region tackles the cyber threat is subtly different. Our experts will take you through some effective security strategies and programmes that you can put in place to protect your "crown jewels" against the evolving global threats. Whether you're a multinational organisation with worldwide operations, or based in one particular region, our webinar will give you a local and global view on how to find your way around the security minefield. Imagine if you could combine intelligence from multiple sources – including government, partners and your own global network – to get a birds-eye view of what’s going on in your organisation, and accurately address your risk and measure its impact? Well now you can and with the right understanding and intelligence, you can better anticipate trends and patterns, your policies and standards, as well as strengthen your day-to-day security. Having the right information at your fingertips is like gold dust and means you can continually learn, improve and be more robust in your cyber defence. Join Hila Meller and Daniel Lawrence on our webinar as we share with you the key things you need to understand to ensure that your organisation stays safe and secure from rapidly evolving threats – and then turn them into opportunities. 77% of CISOs working with BT are actively moving to the cloud or planning to adopt cloud services. Of these, 71% said they have some policies, but 30% stated they don't understand what they are in reality. If you’re thinking about cloud or multi-cloud environments you will need to take a deeper look at your security. Yes, it’s quicker, and agile model and therefore cheaper but it does come with an extra level of risk that previous data centre options mitigated. You’ll need to validate your cloud vendor to make sure your company’s data is separated from other data, that you are getting the context rich information back and that the right people and devices are accessing it. The big thing is to put the necessary and sufficient security and compliance controls in place, and to keep checking that they’re appropriate, effective, and moving forward while you take up the cloud (and beyond). Join our live discussion with BT’s Security CTO to find out what’s required to identify, manage and control threats across your hybrid estate and multiple clouds. We’ll look at how to discover where your data is, who can see it or access it or process it, and how to avoid data sovereignty violations. The webinar will also cover how vital it is to know what we are all responsible for and how can you mitigate for the risks and new threats in order to stay secure..
With the launch of GDPR imminent, we wanted to take the opportunity to discuss how you can ensure you are doing enough to ensure compliance. Join our webinar to hear from our compliance expert Deborah Moir, Head of Security Consulting, where she will discuss the reality of GDPR compliance for large enterprises and what you should be doing to ensure you are in the best possible position to be ready and compliant. GDPR often means a huge overhaul of cyber security, network and processes and because failure to comply can result in a fine of up to four per cent of a company’s turnover or €20 million — whichever is higher you need to do everything you can to ensure you are on top of it. Adapting to GDPR means shifting how you view data protection and security. At its most basic, you need to know you have the right cyber security tools and processes in place to prevent the loss or theft of your customers’ data. And getting it right will open new doors. While data protection might be something you have to do, the new regulation should also be seen as an opportunity to redesign your security strategies in a way that builds a strong brand based on customer trust. Most organisations are too passive in their approach to security. The response to most breaches is passive defence. Battles can be won this way, but not the War. To stay ahead of the game, businesses need an effective digital/threat intelligence strategy. An approach that enables proactive threat hunting, pre-emptive control mitigation based on intelligence and process, visibility over an entire estate and the tools, people, and process to solve problems when they are discovered. We talk to customers often who pay for threat intelligence feeds only to realise that knowing a problem exists doesn’t mean the problem will be solved. Having the right teams and people in place are a lot harder than it sounds. Building a digital threat intelligence capability is about much more than collating technical information on the systems used to launch attacks. • You need to gather evidence-based information on potential attackers, the tools they use, their motivation and the vulnerabilities they exploit, and how understand how this interacts with your business. • Intelligence means improving your understanding and visibility of the risk context your business is in; getting to know your threat landscape better. Creating the perfect blend of people, process and technology for your business. • By sharing data, you can improve your own security and cut intelligence-gathering costs. All of this should be seen not only in the context of present but also future threat. •Sharing intelligence product throughout your business, in a way that everyone can understand. Basically, you need to be one step ahead of the criminals. Security needs to be embedded in any digital transformation strategy. What are the fundamental things you need to get right for your organisation? - What are key issues you need to focus on? - What are the practical things you need to do to get your business case signed off? - How do you get ahead and stay ahead in this complex area? The global scale of the recent ransomware attacks has shown the astonishing speed at which even the most unsophisticated of attacks can spread around the world. But how is it possible to spend millions on cyber security, and still get caught out? And what good are the latest solutions, if you haven’t fixed the basics? In ‘The cyber security journey — from denial to opportunity’, you’ll find out why reaching true cyber security requires a five-stage journey. There is no silver bullet when it comes to security and in order to avoid the dangerous traps along the way, don’t try to run before you can walk. - Why is this new regulation important for your organisation? - Are you ready for the change? With today’s global cyber threat as real as ever, there is still considerable work to be done in the area of threat awareness. At this year’s World Economic Forum in Davos a distinguished panel of experts discussed how to harness the power of threat information and data. Mark Hughes, Chief Executive Officer, Security, BT, demonstrated using the BT Cyber Platform how visual analytics and big data can help bring to life trends and geographic patterns and set them in a new context. Panelists Ciaran Martin, Chief Executive, National Cyber Security Centre (NCSC) and Jayne Plunkett, CEO Asia and Member of Group Executive Committee, Swiss Re Asia Ptd. Ltd., Young Global Leader, talked about the role that public and private partnerships can play and looked at the topic from a risk perspective. The session was moderated by Rob Wainwright, Director, Europol. Watch Professor Tim Spiller from York University and BT’s Andrew Lord talk about the latest developments in quantum key distribution. The evolving threat environment needs ever-evolving strategies to keep vital and highly confidential data secure. The traditional ways of preventing cyber attacks are being challenged by highly organised hackers on the one hand, and a rapidly changing technology landscape on the other. We need to complement our preventative approaches with machine-assisted detection and prediction. In this film, Ben and Robert explore and demonstrate some of the latest technologies we’ve developed to achieve better cyber defence. 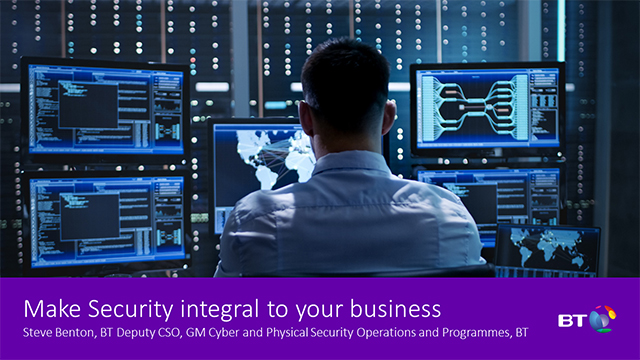 BT’s cyber security services will help you, in real-time, contextualise every relevant internal event with external intelligence, providing a rich picture of what is happening. We can determine immediately which systems may be under threat using our behaviour analytics capability and detect and respond faster to risks, threats and vulnerabilities thanks to world class visualisation and analytic techniques. Deborah Moir takes a brief look at what General Data Protection Regulation (GDPR) is and how it will affect you. As a global leader in managed security, we’re helping customers thrive in a digital world. With operations in over 180 countries, a team of 2,500 experts and 14 SOCs around the world, we have a unique perspective on cyber crime. We’re constantly watching, learning, predicting and responding to the latest threats to protect our customers, using unique tools and insight to stay one step ahead of criminal entrepreneurs. In supporting some of the world’s largest companies, nation states and critical national infrastructures we have an unparalleled insight into the targeted threats and advanced malware on global networks.